Poultry software is based on SAP Business One is complemented with a good poultry management software, it offers great potential for the poultry industries. Our poultry management software focus on egg production (broiler farm), chicken breeding (breeder), feed mill, meat production (market ready broiler) supervisor app, analysis and many more. It must be noted, too, that unlike other business software solutions that deal with inanimate objects, software Poultry Farm Management for poultry business will have to take into consideration live animals. This, the business relies on a high level of manual monitoring and observation. Poultry Industry is spread across branches and lacks centralized easily accessible data collection system. Rearing charges calculation as per scheme and scheme analysis for performance and profit is missing. Its very critical that daily transactions data collection is done real time and on field data like mortality and feed consumption should be accurate. Manage your raw material rate like maize etcon daily basis, send confirmation SMS to confirm the deal. Monitor and control quality of raw material and finished product, set as many parameters as moisture, size etc. Complete sampling process covered. Set approvals for purchase, sale, material inward, material rejection etc. Very flexible system which practically works on daily basis. Material requirement planning gives you control over your production planning with ability to calculate required RM considering current stock and in progress PO with their delivery dates. Book and process your orders with ease, ready to use pick and pack functionality. Complete sales analysis for feed sale. Define multi level bill of material for your products, manage your RM with inventory control methods. While calculating production cost system assures that for accurate calculations, it considers all direct and indirect expenses for cost calculation as labor cost, electricity, water, administrative costs etc. This gives you exact production cost for feed you produce. Facility to manage branch wise scheme with branch performance comparison against scheme. 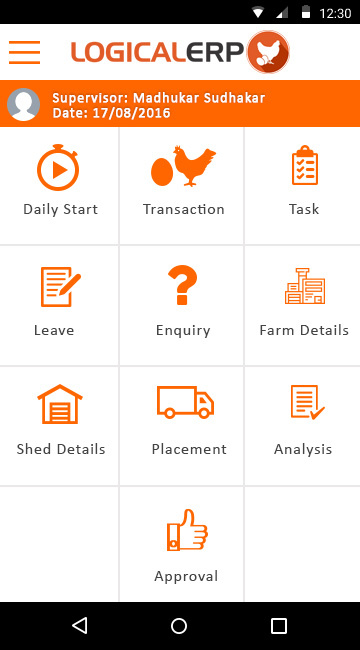 This add on and mobile application covers all transactions for tracking a new farmer and has ability to track and asses his previous company performance. Allows you to calculate exact production cost per kg and per bird. Daily snapshot dashboards which gives you clear idea about your how your branches and farmers are performing. Manage purchase of male / female chicks and brooding process start. Manage daily transactions for brooding, capture all parameters like feed, water, medicine, vaccine consumption. Manage inventory requests with costs using SAP inventory transfer requests. This gives exact value and quantity of feed consumption and inventory movement. Manage egg inventory as per category like commercial eggs, cracked eggs, leak etc. Start capturing egg collection data and generate collection reports and flock performance reports. Manage breeder stages like, brooding, growing, pre laying, laying etcso you understand where your flock is right now. Manages complete chicks sale process. Allows you to plan your sales based on chicks production planning from hatchery. No calculations and calendars are required for your hatchery manager. Delivers you complete egg placement planning report. System allows you to maintain equipment AMCs, maintenance schedules. 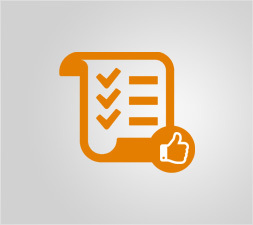 This allows you to make sure equipment gives better performance and lasts longer. Captures temperature and humidity settings from machines and can send you alerts on the fly to avoid emergency. If you are providing hatchery as a service, system allows you to calculate invoices and incentives as per you purchase contract. Manages cold room egg movement, this allows you better control on egg procurement for setters. Manage quality parameters of raw material and finished feed products for quality and sampling purpose. Sed vulputate erat tempus libero bibendum, tempor pellentesque quam tristique. Integer in neque non quam vulputate imperdiet. Donec eget massa in mauris blandit posuere. Donec in tortor ac metus rutrum lacinia. Praesent fermentum ex in sapien lacinia, nec cursus est commodo. Poultry meat processing is initiated by hanging, or shackling, the birds to a processing line. Birds are transferred from coops or transport cages to a dark room where they are hung upside down from shackles attached to an automated line. After stunning, the birds are passed through an automated knife that makes an incision on the neck to cut the major blood vessels in the neck.With the carcass hanging upside down and the major blood vessels cut, the majority of the blood in the carcass will exit. Picking is a term that refers to feather removal. The picker removes the feathers on the carcass. The picker is an automated machine that contains rubber finger like projections that rotate in a circular motion to remove feathers without damaging the carcass. Electrical stunning delivers a current through a water bath to Immediately create a state of unconsciousness.For a complete stun, birds must receive a particular electric exposure for a specified time. Scalding loosens the feathers to facilitate their removal.Carcasses are submerged into the scalder that contains water heated from 125-150°F , depending upon the type and age of the poultry This high water temperature serves to loosen the connection of feathers to the skin. Feet are removed at the ankle joints. The head is cut and removed. The neck is cut with machine and esophagus is exposed. 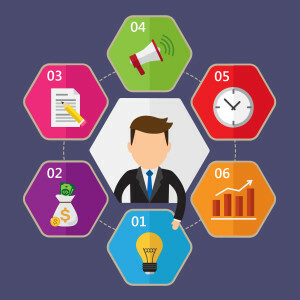 It’s a comprehensive solution that helps you collaborate better and manage the complexity of planning profitable promotions across multiple channels. Our solutions are designed to understand the preferences and behavior of your customers, create real-time visibility for pricing and inventory. SAP provides real-time alerts and analytics with integration of a mobile application. To reduce the back-office efforts in the store by up to 20%. As experts, we take an integrated view of online shopping module in terms of the latest SAP technologies, usability and the user experience. Automating the first steps your inbound sales orders take in SAP has the potential to cut lead times to customers and the cost of processing orders by up to 50%, significantly impacting the order-to-cash cycle. We have vast experience in building store applications that provide a real-time store view to enhance your real-time inventory management. 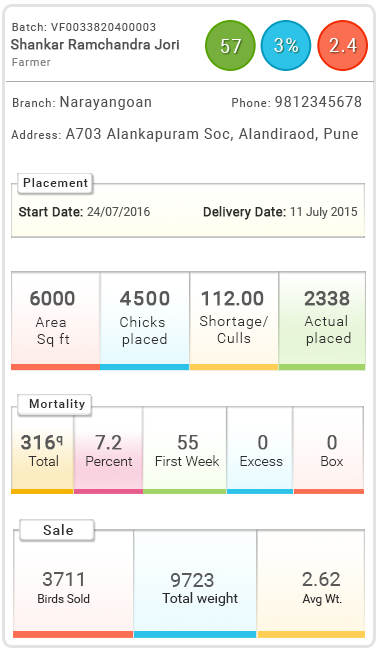 Get complete batch details and farmer details on card view, management and supervisor can use it for quick view. Get you placement dates and delivery dates in one view. Quick indicators allow you to see batch level performance alerts in snap, high mortality, FCR and age. Color changes as per the range. Get shortage, excess and culls details for batch. Get KPI details like density, morality percentage, FCR, mortality ratio, farm performance. All indicators are based on real time data and there is no need to “generate” any report for this view. Staff efficiency increases due to integrated system, avoiding double work. The cost of material received will be directly loaded on material with cost of labor, electricity , water etc. Labor, machine and tools can be used to their optimal level due to better management/ scheduling of production order, payments, deliveries etc. Lesser inventory carrying cost by maintaining optimal inventory level. SAP is scalable with the company and will support the company in longer run . Alert & approval (SMS / email) for particular event to concern person on designated mobile / tablets.